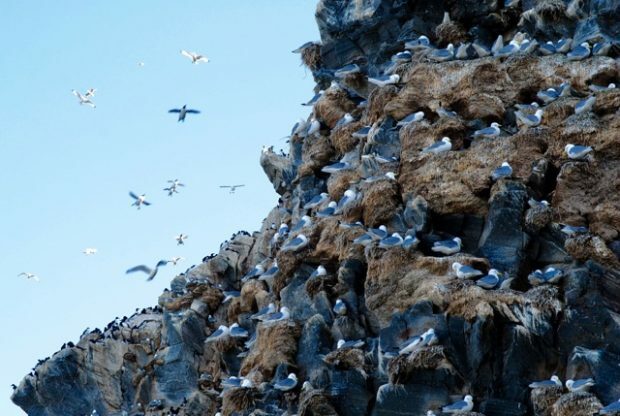 A remarkable Norwegian island where tens of thousands of sea birds nest every year will be the location of the latest “slow TV” project from Norway’s state broadcaster, NRK. It will be a real “cliffhanger” of sorts, from an area that birdwatchers visit from all over the world. 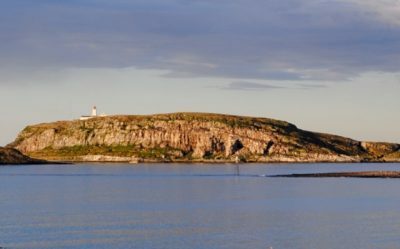 The island is called Hornøya, and it’s located just a 10-minute boat ride from the small city of Vardø on the far northeastern coast of Norway. Vardø is a remarkable place itself, located in Norway’s only polar climate zone and also home to the world’s northernmost fortress, the historic Vardøhus that dates from the 1300s. NRK camera gear could be spotted at the only hotel in Vardø during a visit last week, and on Friday The Independent Barents Observer reported that the state broadcaster has set up 15 remote-controlled cameras on the island’s noisy cliff where as many as 100,000 seabirds congegrate including what’s billed as the “Arctic specialty,” the polarlomvi (Brünnich Guillemot). Puffins, with their distinctive eyes and colourful beaks, can also be spotted along with many other birds including the occasional eagle. 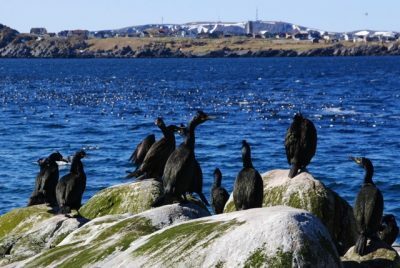 NRK reported that the cameras were put in place before the nesting season began, so as not to disturb the birds even though many are accustomed to people because of the island’s visitors, who can sit in bird-watching shelters or follow a trail up to the island’s lighthouse. NRK will also follow the sea birds with a drone and two cameras with a large zoom, streaming live for five weeks on nrk.no/fuglefjellet (not yet activated) from June 10. Highlights will also be aired in prime time on NRK1, with the real “slow TV” version live on NRK2. “We’ve been thinking for years that we need to focus on what’s happening with our seabirds,” Nils Arne Sæbø, project leader for NRK’s nature programs in Bergen, said in December 2014 when the Hornøya bird project was hatched. NRK1’s popular program Ut i Naturen (Out in the Nature) ran an item on Hornøya earlier this month and soon the viewing marathon will begin for bird lovers and others. (For more details, see a report on the bird project from the Fram Center, which consists of 20 institutions that conduct research, consulting and knowledge-sharing within nature, science and technology from Tromsø). NRK’s slow-TV, which started in 2009 with cameras mounted on one of the trains regularly running between Bergen and Oslo, has become an international hit. US President Barack Obama even joked about it at a White House state dinner earlier this month, where Norwegian Prime Minister Erna Solberg was among the guests. The most astounding success of filming everything from wood-burning fireplaces to choir marathons came with the “minute by minute” coverage of a week-long voyage by one of Norway’s Hurtigruten ships that ply the country’s long coastline. That attracted millions of viewers who sat transfixed in front of their TV or computer screens for hours on end. It remains unclear whether Hornøya’s birds will grab the same degree of attention but the chances are good, especially if the weather is a spectacular as it was when newsinenglish.no visited the island last week. Vardø is, by the way, also home to an artistically remarkable memorial to all the women, and a few men, who were burned at the stake as witches in the 1600, after first being incarcerated in the nearby fortress. Vardø, one of the few communities in Northern Norway that was not burned by retreated Nazi Germans in 1944, also features an historic pub called Nordpolen, a museum devoted to the Pomor trade with Russia, that once made Vardø a prosperous place and elaborate if controversial radar defense systems.